Are parking rules only for the ordinary citizen? Two Govt vehicles parked next to the no-entry barricade opposite OB Shopping Mall at Khyndailad – a no parking zone for all other vehicles. 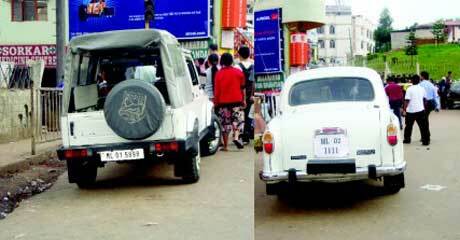 The Ambassador car belongs to a high ranking police personnel and the Gypsy to a govt official. Are parking rules only for the ordinary citizen? Where is the traffic cop here?